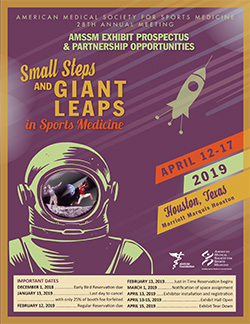 A total of 2171 registrants attended the 2018 AMSSM Annual Meeting (98% physicians). Reserve your booth space: Limited availability - please call (913-327-1415) or email Jody Gold for availability. 10x10 booth fee (includes four complimentary exhibit staff registrations, 6' skirted table, two chairs, sign and wastebasket).